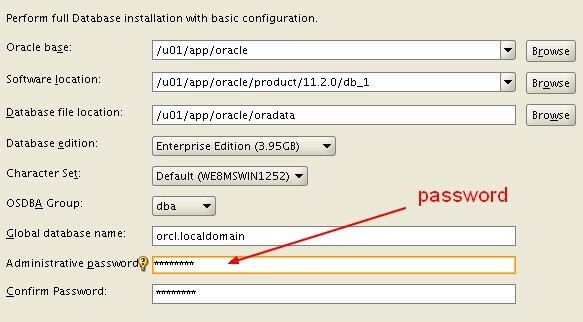 Installation of Oracle Database 11g Release 2 (11.2) on Oracle Enterprise Linux 5. Add Swap space if needed. Verify that the processor architecture matches the Oracle software release that you want to install. Oracle recommends that you install your Linux operating system with the default software packages (RPMs), unless you specifically intend to perform a minimal installation. Linux RPMs are also available on this Web site. You can use JDK 6 Update 10 (Java SE Development Kit 1.6 u10) or JDK 5 (1.5.0_16) with the JNDI extension with the Oracle Java Database Connectivity and Oracle Call Interface drivers. However, these are not mandatory for the database installation. Please note that IBM JDK 1.5 is installed with this release. During installation, for certain prerequisite check failures, you can click Fix & Check Again to generate a fixup script (runfixup.sh). You can run this script as a root user to complete the required preinstallation steps. Sets permissions on the Oracle Inventory directory. Reconfigures primary and secondary group memberships for the installation owner, if necessary, for the Oracle Inventory directory, and for the operating system privileges groups. Sets up virtual IP and private IP addresses in /etc/hosts. Sets shell limits to required values, if necessary. Installs the Cluster Verification Utility packages (cvuqdisk rpm). Using fixup scripts will not ensure that all the prerequisites for installing Oracle Database are satisfied. You must still verify that all the preinstallation requirements are met to ensure a successful installation. You can install Oracle Database on a multihomed computer. A multihomed computer is associated with multiple IP addresses. This is typically achieved by having multiple network cards on the computer. Each IP address is associated with a host name. In addition, you can set up aliases for the host name. By default, Oracle Universal Installer uses the ORACLE_HOSTNAME environment variable setting to find the host name. If ORACLE_HOSTNAME is not set and you are installing on a computer that has multiple network cards, then Oracle Universal Installer determines the host name from the /etc/hosts file. Clients must be able to access the computer either by using this host name or by using aliases for this host name. To verify this, ping the host name from the client computers using the short name (host name only) and the full name (host name and domain name). Both tests must be successful. Verify the value of the DNS configuration file resolv.conf. The nameserver must be not set or set to a valid DNS server and you can add the two time-out parameters. and use one group as the primary group for any user requiring administrative privileges for Automatic Storage Management, and Oracle Database administration. This group must also be the Oracle Inventory group. To simplify using the defaults for Oracle tools the group name should be oinstall. Log in as root to create groups and users. OSDBA dba This group identifies operating system user accounts that have database administrative privileges (the SYSDBA privilege). OSOPER oper This is an optional group. Create this group if you want a separate group of operating system users to have a limited set of database administrative privileges (the SYSOPER privilege). This group cannot directly connect as SYSOPER, unless explicitly granted. However, they will have the privileges granted by the SYSOPER privilege. OSASM asmadmin SYSASM privileges for Automatic Storage Management files provide administrator privileges for storage file. In Oracle documentation, the operating system group whose members are granted SYSASM privileges is called the OSASM group, and in command lines, is referred to as asmadmin. Automatic Storage Management can support multiple databases. Members of the OSASM group can use SQL to connect to an Automatic Storage Management instance as SYSASM using operating system authentication. The SYSASM privileges permit mounting and dismounting disk groups, and other storage administration tasks. SYSASM privileges provide no access privileges on an RDBMS instance. If you do not designate a separate group as the OSASM group, then the OSDBA group you define is also by default the OSASM group. OSOPER asmoper This is an optional group. Create this group if you want a separate group of operating system users to have a limited set of Oracle instance administrative privileges (the SYSOPER for ASM privilege), including starting up and stopping the Oracle ASM instance. By default, members of the OSASM group also have all privileges granted by the SYSOPER for ASM privilege. If you want to have an OSOPER for ASM group, then the grid infrastructure owner must be a member of this group. Oracle recommends that you create one software owner to own each Oracle software installation (typically, oracle, for the database software and grid for the Oracle Restart owner user). You must create at least one software owner the first time you install Oracle software on the system. Oracle software owners must have the Oracle Inventory group as their primary group, so that each Oracle software installation owner can write to the Central Inventory. The database software owner (typically, oracle) must also have the OSDBA group of the grid infrastructure home so that database instances can log on to Automatic Storage Management, and (if you create it) the OSOPER group as secondary groups. In Oracle documentation, the Oracle software owner users are referred to as oracle users. For Oracle grid infrastructure only, the grid user (grid) needs to be in the OSDBA group of every database home. but you want to use a different operating system user, with different group membership, to give database administrative privileges to those groups in a new Oracle Database installation. The -u option specifies the user ID. Using this command flag is optional, as you can allow the system to provide you with an automatically generated user ID number. However, you must make note of the oracle user ID number, as you require it later during preinstallation. To increase the shell limits: Depending on your environment, make the following changes for all Oracle installation owners. The steps below only show the user oracle. The kernel parameter values shown in the following section are minimum values only. (in bytes), whichever is lower. If the current value for any parameter is greater than the value listed in this table, then the Fixup scripts do not change the value of that parameter. set the ORACLE_BASE environment variable for the user Oracle to specify the Oracle base directory that you have created. The Oracle Inventory directory (oraInventory) stores an inventory of all software installed on the system. The Oracle home directory is the directory where you choose to install the software for a particular Oracle product. Oracle Universal Installer creates this directory path that you specify under the Oracle base directory and then you do not need to create this directory. Alternatively, this alteration can be done using the GUI tool. You run Oracle Universal Installer from the oracle account. However, before you start Oracle Universal Installer you must configure the environment of the oracle user. To set the environement variable, we will modify the shell startup script. Do not install Oracle Database 11g Release 2 (11.2) software into an existing Oracle home. Login as the oracle user and add the following lines at the end of the login configuration file which depend of your shell. The installation files are on the hard disk, then we change in the directory to the database directory and enter the runInstaller command. Oracle Universal Installer automatically installs the Oracle-supplied version of the JRE. This version is required to run Oracle Universal Installer and several Oracle assistants. Do not modify the Java Runtime Environment (JRE) except by using a patch provided by Oracle Support Services. Create and Configure a Database: This option creates a new database along with sample schemas. Install Database Software Only: This option only installs the database binaries. To configure database, you must run Oracle Database Configuration Assistant after the software installation. Upgrade an Existing Database: This option installs the software binaries in a new Oracle home. At the end of the installation, you can upgrade the existing database. Server Class: Choose this option if you are installing on a server class system, such as what you would use when deploying Oracle in a production data center. This option allows for more advanced configuration options. Advanced configuration options available using this option include Oracle RAC, Automatic Storage Management, backup and recovery configuration, integration with Enterprise Manager Grid Control, and more fine-grained memory tuning, among many others. Typical Installation: This installation method is selected by default. It lets you quickly install Oracle Database using minimal input. It installs the software and optionally creates a general-purpose database using the information that you specify on this screen. Advanced Installation: This installation method enables to perform more complex installations, such as creating individual passwords for different accounts, creating specific types of starter databases (for example, for transaction processing or data warehouse systems), using different language groups, specifying e-mail notifications, and so on. By default, the Oracle Inventory directory is not installed under the Oracle Base directory. This is because all Oracle software installations share a common Oracle Inventory, so there is only one Oracle Inventory for all users, whereas there is a separate Oracle Base for each user. When you run the root.sh script, the script prompts you for the path of the local bin directory and automatically copies the oraenv, coraenv, and dbhome scripts to the directory that you specify. The default local bin directory is /usr/local/bin. If you do not run the root.sh script, then you can manually copy the oraenv or coraenv and dbhome scripts from the $ORACLE_HOME/bin directory to the local bin directory. When you install Oracle Database, some options are enabled and others are disabled. If you want to enable or disable a particular database feature for an Oracle home, then shut down the database and use the chopt tool. Oracle recommends that you back up the root.sh script ($ORACLE_HOME/root.sh) after you complete an installation. If you install other products in the same Oracle home directory, then Oracle Universal Installer updates the contents of the existing root.sh script during the installation. If you require information contained in the original root.sh script, then you can recover it from the backed up root.sh file. Start the script utlrp.sql as sys. This script recompiles all PL/SQL modules that might be in an invalid state, including packages, procedures, and types.